10. 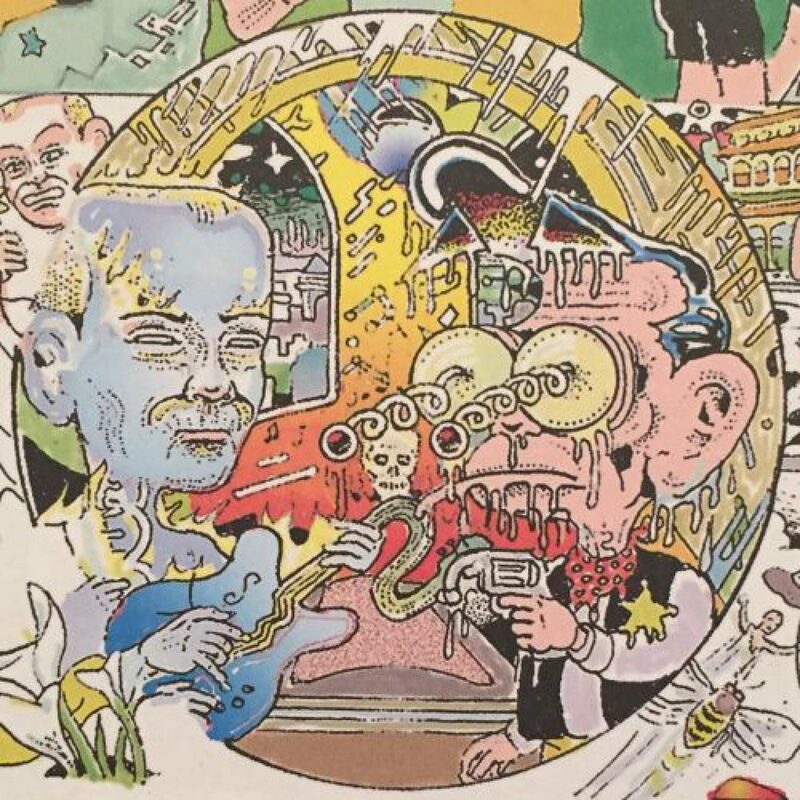 Compulsive Comics By Eric Haven (Fantagraphics) – Haven’s surreal strips appear far too infrequently, so getting two collections of them two years in a row like we have is genuine cause for celebration. Like Fletcher Hanks on bad acid with plenty of deadpan humor and gorgeous linework and color, the worlds Haven creates are what bad dreams would look and feel like — if they were fun. Plus, he accidentally kills a bunch of famous cartoonists in this one. 9. From Lone Mountain By John Porcellino (Drawn+Quarterly) – We all know that Porcellino’s King-Cat Comics is one the true treasures of this beleaguered medium we love, but what’s less well-known is what an absolute roll this series was on in the early-to-mid 2000s. This superb collection presents the very best of those years, when Porcellino was really getting a firm grip on the wistful, evocative, “tone poem” character that the series maintains to this day. Simply beautiful. 8. Red Winter By Anneli Furmark (Drawn+Quarterly) – One of the most heartfelt and stirring love stories to grace the comics world in some time, every forlorn glance and stolen moment these two doomed paramours share is a stake through the heart, lushly rendered against a backdrop of political intrigue and familial drama. Furmark’s strips are a national institution in Sweden — here’s your chance to see why. 7. Dumb By Georgia Webber (Fantagraphics) – The most harrowing and heartfelt autobio work of this year, Webber’s chronicle of her extended period without the use of her voice, originally self-published as a series on minis, is a privileged look at the challenges and daily practical demands of navigating through a hitherto-unforeseen health crisis. A very silent scream, indeed. 6. Somnabulance By Fiona Smyth (Koyama Press) – Long overdue, this massive retrospective of the work of one of Canada’s pioneering feminist cartoonists skirts our rules a bit by presenting material from both the previous century and this one (we’ll be breaking that again before this is over, fair warning), but who’s complaining? This is true auteur material, showcasing a world all its own, as foreign as it is immediately recognizable, inhabiting a space somewhere between dreams and reality. No one does it like Smyth, and no one else ever will. 5. Book Of Daze By E. A. Bethea (Domino Books) – By contrast, Bethea’s work has a way of making the actual, waking world we all know feel dreamlike, ethereal, and mysterious — even its dingiest corners. A slimmer collection than the others on this list (and the only one released as a magazine rather than a book), what this comic lacks in terms of physical heft it more than compensates for in the creation of a hermetically-sealed reality all its own. 4. The Song Of Aglaia By Anne Simon – French cartoonist Simon has long been admired “across the pond” for her detailed cross-hatching, inimitable facial expressions, and imaginative character designs, and as an “intro volume” for American readers, this feminist fairy tale is absolutely exemplary and painfully amusing. Lots of “Easter eggs” scatted throughout for Beatles fans as well in this amazingly charming, immersive volume. 3. Angloid By Alex Graham (Kilgore Books) – The mystical and mundane collide with results ranging from the heavy to the hilarious in Graham’s masterwork (to date, at any rate), culled from self-published minis and strips in her large format Cosmic BE-ING ‘zine. A sharp and wry take-down of both the art world and life on the economic margins, Graham will make you wish that you had some alien inter-dimensional helpers on your side just as her stand-in protagonist does, but you know what? You don’t need their assistance to recognize one of the most utterly unique and self-assured books of the year. 2. Providence : The Complete Slipcase Set By Alan Moore And Jacen Burrows (Avatar Press) – Superlatives aplenty have already been heaped upon Moore and Burrows’ Lovecraftian masterpiece, including from yours truly, so we needn’t revisit all that beyond saying that this isn’t simply one of the best horror comics ever made, but one of the best comics, period. Publisher Avatar has a reputation for producing some of their trade paperbacks and even hardcovers on the cheap, but this comprehensive collection, which also includes the prequel/sequel stories The Courtyard and Neonomicon, is very handsome indeed, and the inclusion of Dreadful Beauty : The Art Of Providence gives readers a fascinating look at Burrows’ criminally-underappreciated art in gorgeous black and white. An expensive set, to be sure, but more than worth every penny. 1. Berlin By Jason Lutes (Drawn+Quarterly) – Come on, what else was it going to be? Lutes’ sprawling, epic, highly personal tale of life in Weimar Berlin, over two decades in the making (told you we’d be skirting that “post-2000” rule again), stands as one of the high-water marks in the history of the medium, and this tremendous hardcover collection pulls out all the stops to present work this monumental in the format that it so richly deserves. A true masterpiece by any definition of the term. And there we have it! Next up — Top 10 Vintage Collected Editions. I’m aiming to get that one up tomorrow, hope to have you along for the ride! Yup, even more stuff you need to own!